Enterprise Rent-A-Car advertise their services and the upcoming Star Trek Beyond movie with a new commercial. The spot starts with a guy teleporting himself from the company’s kitchen after having eaten the last doughnut on the sly. The next scene features an Enterprise Rent-A-Car employee saying: “Since our partnership with this summer’s highly anticipated film Star Trek Beyond, things have been getting pretty interesting around here”. Other two employees are shown listing the company’s assets: “Spaceships. We’ve got spaceships. And cars, SUVs, moving trucks, even exotics” and then a couple interested in renting a spaceship is featured. The first employee continues her speech: “We are getting to know a lot about our new customers; the Romulans always get the damage waiver”. The voiceover says, at the end of the spot, that “Enterprise is making this summer beyond awesome” and recommends the viewers to access the company’s website for a chance to win great prizes and to see Star Trek Beyond in theaters July 22. 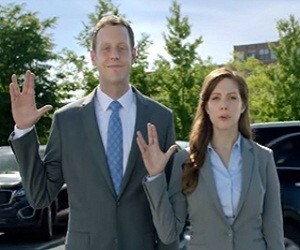 “Live long and prosper” say two employees before the voiceover adds the company’s tagline: “Until we can beam you up, we’ll pick you up”.